Anouska Chisholm, Marc Armstrong, Neil Eatock and Hilary Alcock set themselves the challenge to conquer the three highest mountains in England, Wales and Scotland in just over 36 hours. 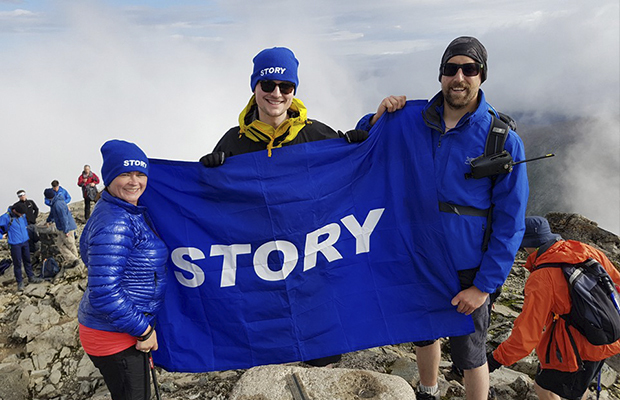 The Story team joined a fearless group of nearly 200 participants in order to raise money for the charity Railway Children, which helps children at risk on the streets. The famous endurance challenge took place on Thursday 23 June and involved the group scaling Ben Nevis, Snowdon and Scafell Pike – estimated to be the equivalent of walking one third of the way up Mount Everest. The aim for each four-man team taking part in the Three Peaks Challenge by rail is to raise a total of £3,500 to help fund outreach projects with street children in India, Africa and the UK. Now in its twelfth year, the challenge has raised over £2 million and each year has helped Railway Children reach 5,000 new children who are at risk, needing shelter, food, clothing, medical supplies, education and counselling. Katie Mason, Events Manager at Railway Children said she was delighted Story was taking on the challenge for the charity.